I hear the Caribbean calling -- and here's a way to win your way to the biggest poker event in the West Indies this fall! 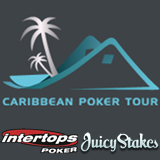 Starting tomorrow, Intertops Poker and Juicy Stakes Poker, the two top sites on the Revolution poker network, will be hosting Caribbean Poker Tour Satellites. The champion wins a $2500 prize package sending them to compete in the The Caribbean Poker Tour Main Event in St Maarten in November. The three-step online tournament series begins August 20th with eight $2+$0.20 tournaments every day, each awarding three tickets to Step 2. Step 2 tournaments ($10+$1) begin August 21, each awarding a ticket to the $50+$5 Final Sunday, September 14th. The winner of that tournament gets a $2500 CPT prize package including $1100 Main Event buy-in, four nights all-inclusive casino-resort accommodation and travel expenses. Once again, poker players from around the world will gather on the beautiful island of St Maarten for the Caribbean Poker Tour, October 30 until November 8. The CPT Main Event (buy in $1000 + $100) is November 1 & 2, just prior to the WPT Caribbean tournament that begins the next day in St Maarten. The Caribbean Poker Tour’s complete schedule of satellites and main events is at http://caribbeanpokertour.com/tour/poker-schedule. “Working together we can offer bigger and better promotions,” added Juicy Stakes’ manager. Intertops has been one of the most trusted online poker room, casino and sportsbook sites in the world since the early days of the internet. It’s known for its friendly customer service and hassle-free deposits and withdrawals Juicy Stakes Poker is well known all over the world for its online poker tournaments and generous reload bonuses. It offers Texas Hold’em, Omaha and Omaha Hi-Lo as well as new no-waiting “fast fold” tables.